The last time I ate a Christopher Mulder-made plate of food was at the excellent Bistro St-Jacques and the year was 2011. So what pleasure to find him again, five years later, at Rustiek, in the space Bistro St-Jacques used to call home. I think the splashes of red may be new to the room, and certainly the handsome signage, but otherwise the well-windowed corner restaurant with its ceramic floor, small bar, and raised deck seems to me unchanged from those St-Jacques days. I had a little weep when Bistro St-Jacques closed. It had seemed the last one standing. French restaurants in old Hull used to dominate the capital’s fine dining scene, with places like Laurier sur Montcalm, Café Henry Burger, Bistro 1908, Le Panaché, Le St-Estephe, L’Aubergine, Le Verlan, Le Tartuffe, Le Sans Pareil, Fleur de Sel, Bistro St-Jacques (and, most recently, its replacement, Gy Resto). 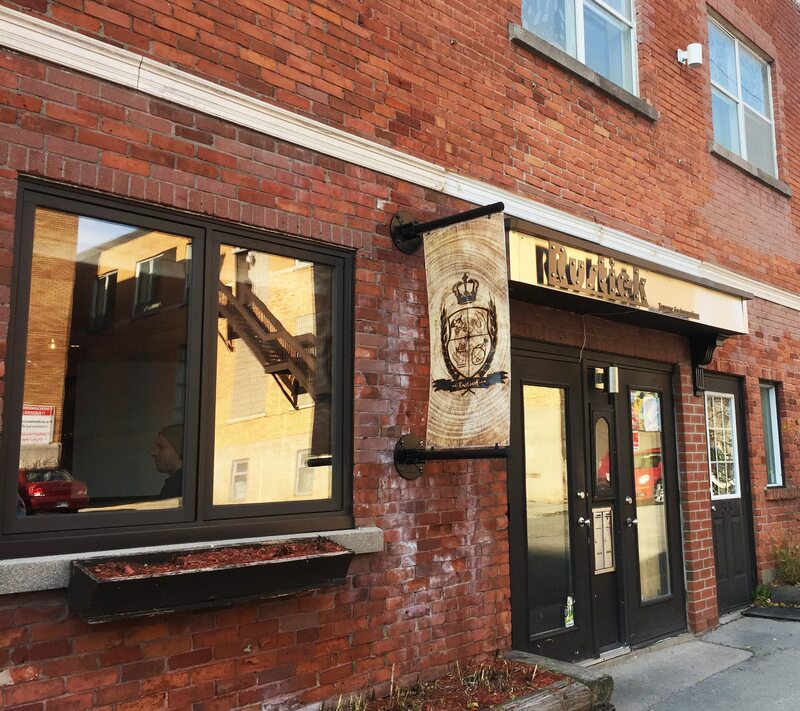 Unlike its predecessors at this address, the new Rustiek is not a French restaurant. 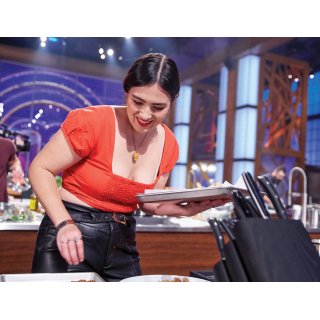 Indeed, the cooking is more Germanic or Dutch-leaning, with pork dishes served with schnupfnudel (sort of elongated noodle-shaped gnocchi) and beer-braised beef with cabbage and apples. 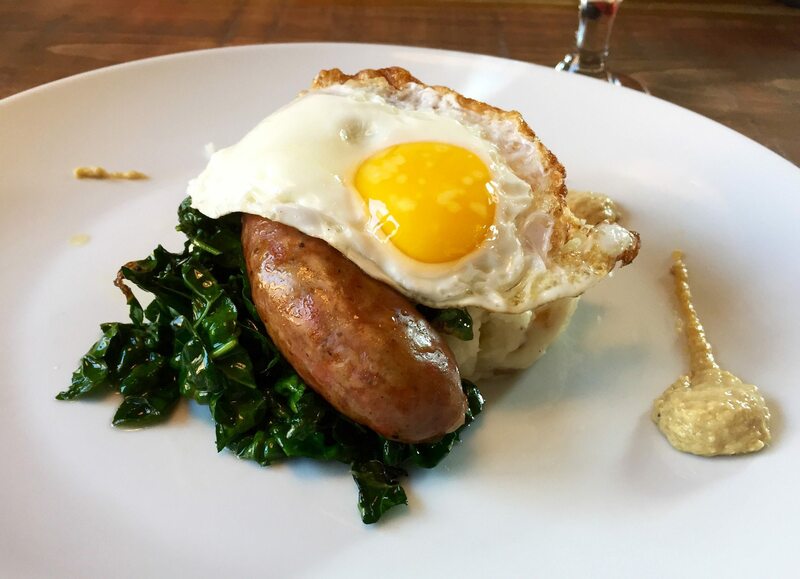 Also with lunch dishes like schnitzel in a bun, and stamppot, a traditional Dutch dish of mashed potatoes with sauerkraut and kale, served with a sausage and, here at Rustiek, crowned with a sunny egg. You can taste the French polish, though, in some dishes. Mulder’s verrine of chicken liver mousse with pork rillettes and a sparkling apple gelée (made with Gin de Neige) is quite wonderful. But with this new restaurant, the chef seems to be mining his northern European roots. And those don’t seem to include vegetables. The vegetarian with whom I shared a Rustiek lunch was struggling to find a main to order. “I could ask the kitchen to put something together…” our server suggested, though he sounded a bit uncertain about the chances of that. 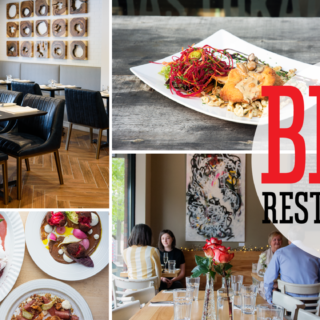 So best to approach Rustiek with an appetite for hearty, meaty dishes. 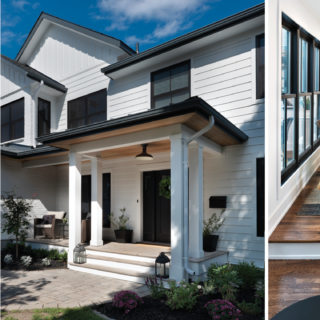 Some fail to hit the mark, but most show creativity, are well executed, and prettily presented on everything from slate and board to fine bone china. The grumble I have with some dishes is the tendency to plate too many competing flavours. The salmon at lunch, for instance, in addition to being overcooked, was overwhelmed with a powerfully-spiced squash purée; the scallops at dinner with an imbalance of too many shrimp and chickpea fritters and with an uncomfortably-sweet beet ‘caramel’. I also found the corn soup with swirl of pepper purée and charred corn kernels, looked prettier than it ate. Otherwise, there are things to like here! Starting with the house-made charcuterie. We elected not to eat the full board of it, offered as a starter on the dinner menu, but found evidence of its pleasures in an open-faced Reuben sandwich at lunch, served with salad and good fries. The sandwich featured smoked tongue pastrami that was excellent. Delicious too, the garnet slices of bresaola that crowned a roasted vegetable salad at dinner. Full marks as well, for the simple goodness of a salmon gravlax starter. The fish came propped up on house-made dark rye, topped with an arugula salad sharpened with pickled shallots and balanced with a sharp, creamy rémoulade. A cone filled with curry-dusted calamari, quite tender and fresh tasting, was a lunch time hit. It came with a curried mayonnaise, the heat and rich offset with a tart little salad of chopped cucumber and ground cherries. 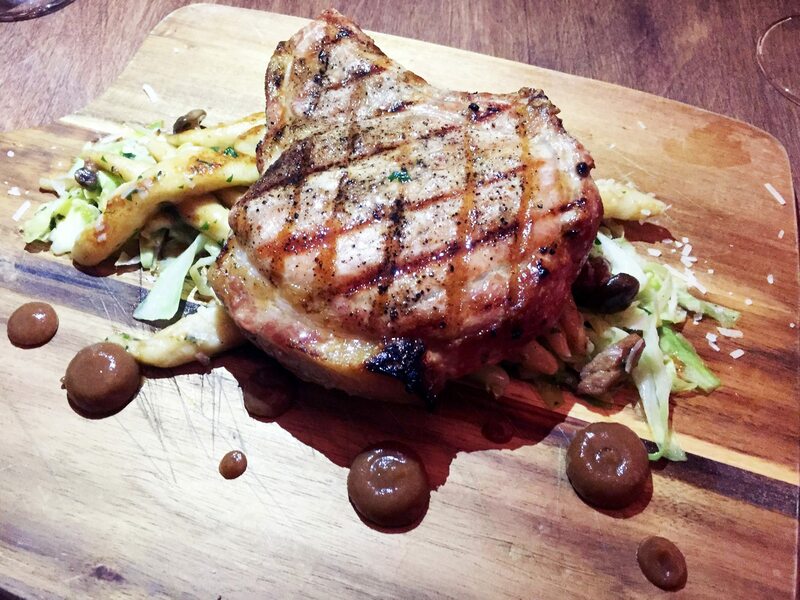 Best to bring a big appetite to the grilled pork chop. It sat heavily on a bed of herbed schnupfnudel. These were poached, then fried with beech mushrooms and lightly sautéed cabbage moistened with a smoked pork hock broth. A welcome bit of sweetness was found in the dark dobs of a fig and orange gel. Desserts are not afterthoughts. 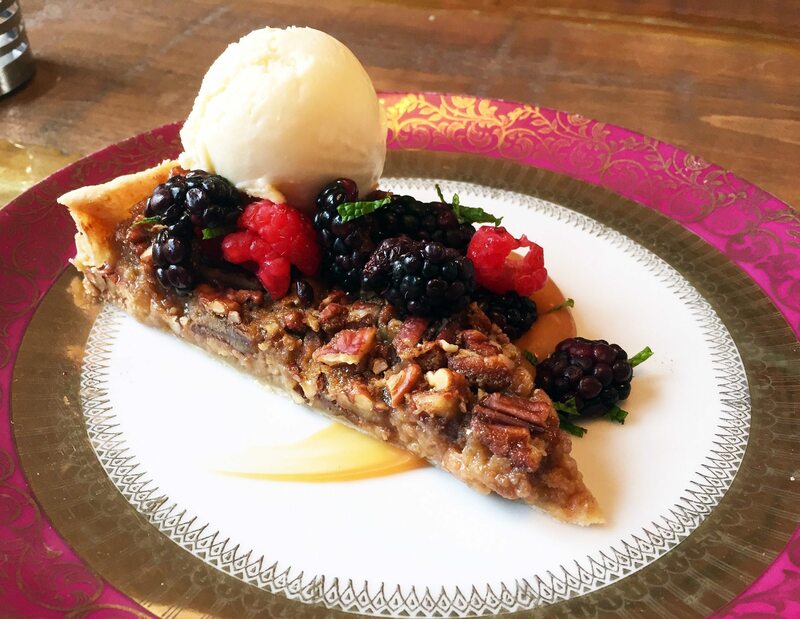 Mulder’s pecan-maple tarte with caramel sauce and house-churned ice cream was a tour de force, served with mint-laced berries that did an admirable job of cutting some of the sweet. Beer list, as you might expect with this food, is fussed over. Main dishes, $24 to $28. Open for lunch and dinner, Tuesday to Friday; dinner Tuesday to Saturday.